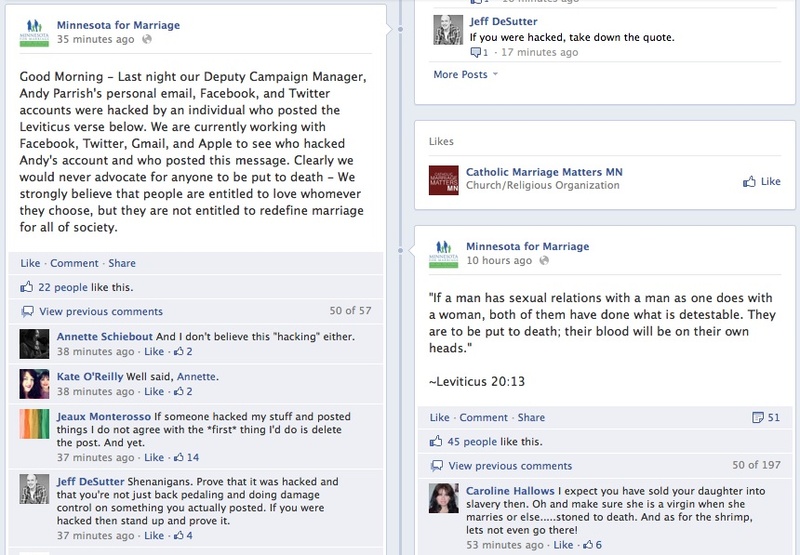 Something really interesting happened over at the Minnesota for Marriage Facebook page yesterday. 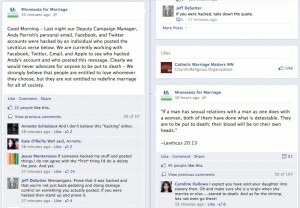 Someone posted a verse from the Christian bible chapter “Leviticus” that calls on gays to be put to death. And the outcome? Their supporters loved it. There were 30 likes by the time a screenshot was captured, and over 50 as I write this. Here’s the original image of the posting. Their response? They were hacked. So you can’t have it both ways. Either you stand by what you said, or you take down the post. NOTE: The posts in question are public posts, meaning you do not have to “Like” the organization to read them (just be a Facebook member), and thus, the responses are public. That’s why I have not blanked out any names.